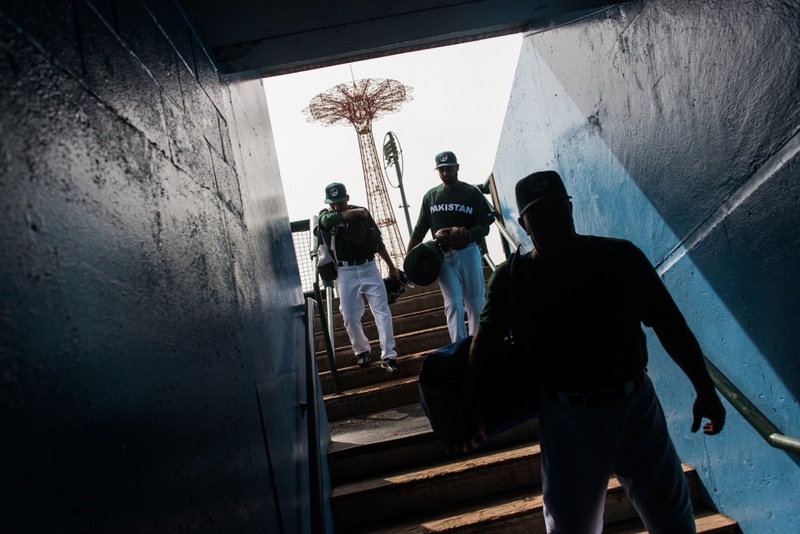 （NY Times, SEPT. 20, 2016）　Straight off a bone-wearying 24-hour journey, the Pakistani national baseball team went about its inaugural workout in the United States on Tuesday before the Coney Island backdrop of Nathan’s Famous restaurant and the Cyclone roller coaster. 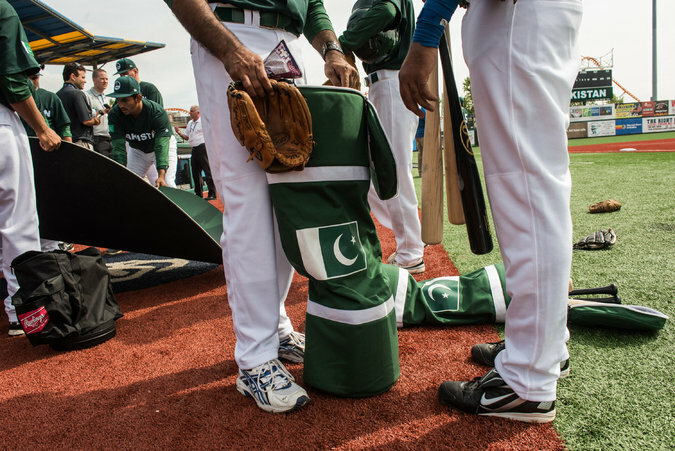 The Pakistanis were at MCU Park in Brooklyn for the qualifiers of the World Baseball Classic, which begin Thursday, and they were hoping to find their equilibrium on unfamiliar ground. “It’s like going from a black-and-white world to a world of color,” said third baseman Zubair Nawaz, speaking through his interpreter and manager, Syed Fakhar Shah. Unlike the other three national teams here to compete in the play-in qualifiers — Israel, Britain and Brazil — Pakistan fields no players born or raised in the United States. Nawaz, for instance, is something of a star cricket player back in Pakistan, still occasionally receiving the equivalent of $50 to participate in a single match at home. But since 2009, he has also been playing baseball, one of several converted cricketers nurtured by coaches whose main instructional tools were American baseball videos. While Nawaz was saying this, the founder of Pakistani baseball, Syed Khawar Shah, sat in the front row by the third-base dugout, proudly watching his team field grounders on the alien artificial turf. Khawar Shah is the secretary of Pakistan Federation Baseball and the father of the national team’s manager, Fakhar Shah. Khawar Shah brought baseball to Pakistan in 1992, hoping to participate in what was — and will be, again, in 2020 — an Olympic sport. Cricket and field hockey were then the country’s two major sports. Baseball teams were established in all four Pakistani provinces, with a championship tournament aired on a major television network. While cricket remains the most popular sport in Pakistan, Fakhar Shah insisted that baseball was competing with field hockey in terms of fan interest. He boasted of solid performers on his evolving roster, including a strong-hitting catcher, Umair Imdad Bhatti; a fireplug center fielder, the 5-foot-9-inch Muhammad Sumair Zawar; and a right-handed starter, Ihsan Ullah, who can throw in the low 90s. Difficulties remain, however. It was the rainy season in Pakistan last month leading to these games, reducing opportunities to practice. The federation’s finances are limited, and most important, there are no real baseball stadiums in Pakistan. Many players started training in the sport on one of the two fields at the United States Embassy. Fakhar Shah and others were forced to scout cricket matches for talent, though now there is an influx of younger players coming through the system and lifting the national team. Travel remains challenging, for both economic and political reasons. Only 24 of the 29 Pakistani players were on hand Tuesday, while the arrival of others had been stalled until at least Wednesday because of visa problems. There was also a real chance that Pakistan, a Muslim nation, would face Israel during this modified double-elimination tournament, which would present obvious international intrigue. Officials in Pakistan, unlike those in Iran, do not ban competition with Israel. However, such a competition remains a delicate subject. Israel’s manager, Jerry Weinstein, a coach with the Colorado Rockies, said global diplomacy was the last thing on his mind. Fakhar Shah is proud that his squad comprises native-born players. The rosters from the other teams here are generously sprinkled with American-born or American-raised players, some of them minor leaguers and others former major leaguers. The World Baseball Classic, unlike the Olympics, does not require athletes to be passport-holding citizens of the nation they play for. Instead, they must merely meet the standards that would be required of them to apply for citizenship. Israel, which faces Britain on Thursday, has its own share of complications. Weinstein will field several fatigued minor leaguers who have already played a long season. The Pakistanis have imported a few American coaches for tutoring. Pete Durkovic, a former minor leaguer from New York, was throwing batting practice on Tuesday after offering to help. Fakhar Shah and the team coordinator Mohammad Muzamil Anwar, from the Bronx, are searching major league front offices for potential Pakistani-American contacts. Farhan Zaidi, the Dodgers’ general manager, is a Canadian-American with Pakistani roots. That is the sort of connection that Fakhar Shah hopes will make future recruiting easier. The publicity from this tournament also figures to help. Pakistani fans may be able to follow the qualifiers through live streaming on MLB.com. The opener against the higher-ranked Brazil team is not expected to go well, but then again, other things are at stake.